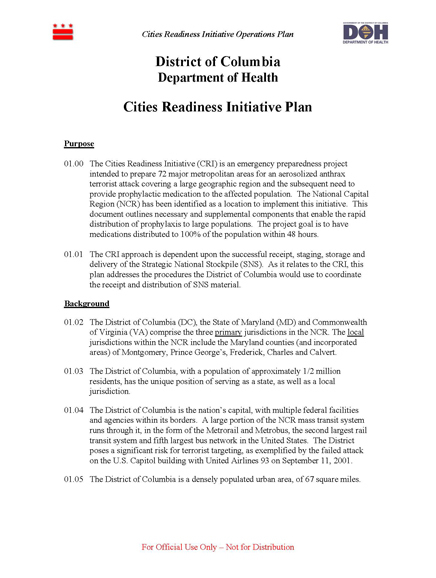 01.00 The Cities Readiness Initiative (CRI) is an emergency preparedness project intended to prepare 72 major metropolitan areas for an aerosolized anthrax terrorist attack covering a large geographic region and the subsequent need to provide prophylactic medication to the affected population. The National Capital Region (NCR) has been identified as a location to implement this initiative. This document outlines necessary and supplemental components that enable the rapid distribution of prophylaxis to large populations. The project goal is to have medications distributed to 100% of the population within 48 hours. 01.01 The CRI approach is dependent upon the successful receipt, staging, storage and delivery of the Strategic National Stockpile (SNS). 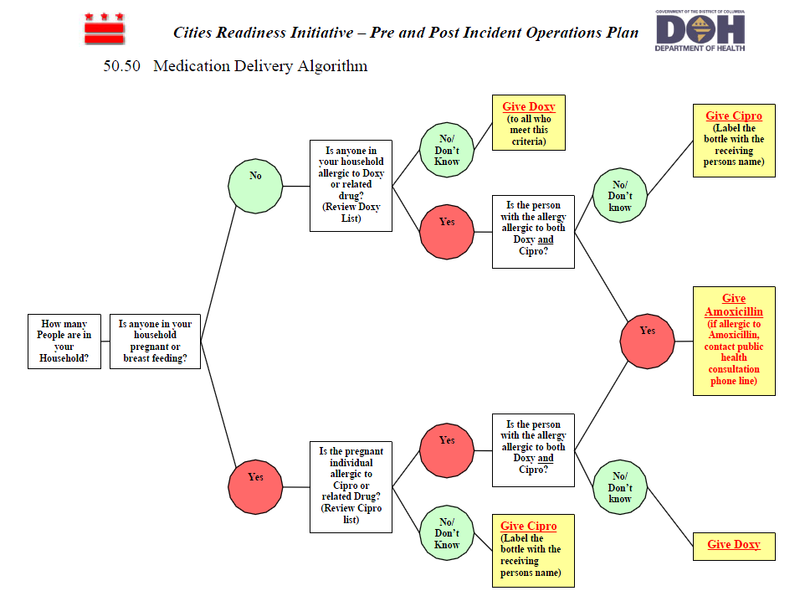 As it relates to the CRI, this plan addresses the procedures the District of Columbia would use to coordinate the receipt and distribution of SNS material. 30.36 Law enforcement agencies will activate their (classified) SNS security plan and coordinate activities with all other agencies through the District EOC. Exceptions to the driving restrictions for RSS and QDC staff will be coordinated with law enforcement agencies.